2013 Best Album - Journal Critics' Poll. Our Orient House Ensemble's Songs Of The Metropolis is 2013 Best Album according to Jazz Journal Critics' Poll. The metropolis is central to the life of a jazz musician. It's where the work is, where the conservatories are, where the music emerged and developed. Gilad Atzmon, the saxophonist and composer who's been described as the hardest working man in UK jazz, writes that Songs Of The Metropolis is "A pursuit of the sound of the city." It's a pursuit that takes him to seven of the world's most famous cities, to a small English seaside town and to "Somewhere In Italy." It proves that there is no single sound of the city, but the plethora of sounds Atzmon discovers are vibrant and beautiful. The Orient House Ensemble formed in 2000: this lineup has been in existence since 2009, when drummer Eddie Hick replaced Asaf Sirkis. Atzmon has previously looked to the cities of the world for inspiration—Baghdad, London and New York have all found their way into his song titles—but never before have they been so central to one of his albums. Each tune reflects a particular quality of the place, as envisaged by the composer and described briefly in his sleeve notes. "Paris" is romantic, Frank Harrison's crystalline piano motif and Atzmon's accordion creating images of lovers at pavement cafés. "Tel Aviv" is full of energy and tension. "Manhattan"—notably, not New York as a whole—is funky, constantly on the move, Yaron Stavi's bass groove and Hick's percussion underpinning Atmon's flowing soprano sax. "Scarborough" namechecks the seaside town known for its jazz festival and for the English folk song "Scarborough Fair" which forms the tune's central musical theme and the starting point for Atzmon's emotive soprano sax solo. You might be fooled, by the playful waltz that opens this set's portrayal of Vienna, or by the solemnly marching chords introducing Moscow, into thinking that volatile reeds virtuoso Gilad Atzmon has grown tired of fighting battles and finally opted for the expected. But it's Atzmon, and he doesn't do expected – tensions, surprises, shocks and ambiguities are a lot more interesting. Concentrating on clarinet and soprano sax, and inviting equal participation from his three Orient House Ensemble partners, Atzmon draws the Paris romance toward more dangerous emotions in a tumult of rising glissandos against Eddie Hick's fierce drumming, and takes the initially vivacious dance of Tel Aviv into mysterious spaces more reminiscent of Miles Davis and Wayne Shorter's In a Silent Way. Buenos Aires expresses a pulsating heat in which motifs wander as if in a haze, Scarborough Fair arrives late in the song devoted to the town, before the track unexpectedly turns into a Coltrane-quartet modal storm for the excellent Frank Harrison's McCoy Tyner-inspired piano. The playing is generally stronger than the writing – but since it's such high-class playing, that hardly matters. 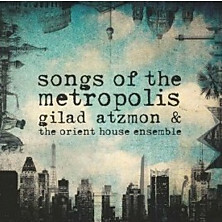 Isr aeli-British saxophonist/tunesmith/polymath Gilad Atzmon and his combo the Orient House Ensemble have an intriguing new album out, Songs of the Metropolis, a tribute to great cities around the world. Most of it is streaming at Atzmon’s album page. The band here is the same as on Atzmon’s excellent previous album: the bandleader on alto and soprano saxophones and accordion, along with Frank Harrison on piano, Yaron Stavi on bass and Eddie Hick on drums. As one would expect from an intellect as formidable as Atzmon, it’s no “look ma, I’m playing a tango now” type of genre-hopping; rather, it’s a series of impressions. Good music is not enough: Gilad Atzmon has always favoured high concepts to help convey his message. This gets him into trouble when the high concepts are overtly political. Atzmon must be the only jazzman whose merchandise contains the last half dozen CDs and a book of polemic entitled The Wandering Who? "Stick to the music," has been the refrain of conservatives since the radical anti-Zionist arrived from Israel in 1994. Except that his world view is evident in every note of the music: variously etched with white-hot passion or withering scorn and brimming with controlled anger or raucous glee. His latest CD, Songs of the Metropolis, contains pieces inspired by cities and locales. What could be more harmless? The focus here is on his composing as much as his playing. 'Moscow' is an iron romance held together by rolling Borodin chords, shifting between severity and prettiness, and 'Berlin' invokes the shade of Kurt Weil with a spot of Weimar-style decadence. 'Tel Aviv' begins with an urgent clamour before the soprano digs into some deep blues, coloured by Arab modes, and rapidly gains in intensity. The power and bite of Atzmon full-on is breathtaking. A mighty handful, indeed. If the records are powerful, they only hint at the unfettered force of Atzmon in the flesh. Stick with Atzmon: He’ll Take You Places! Atzmon’s newest release, Songs of the Metropolis, is a must in any jazz lover’s collection. “Multireedsman” but primarily a superb saxophone player, Atzmon has produced a bouquet of homages to some of the greatest cities of the world, their music and their culture. Stick with Atzmon, he’ll take you places! Places like Paris, Tell Aviv, Buenos Aires, Vienna, Manhattan, Moscow, “Somewhere in Italy,” Berlin and yes, Scarborough too. Atzmon’s “Paris” is sweet and flavorful as a madeleine, without being maudlin. It is the love story between a tender yet confident sax and a lovingly attentive and crystalline piano (Frank Harrison). It is a madeleine that makes the search for “lost time” a worthwhile endeavor. The sax finale has the long finish of the best, properly aged French wine. “Tel Aviv”’s staccato with brief, subtle allusions to oriental tones pulls off the remarkable evocation of declarative purpose and oneiric longing, to which the percussion accompaniment (Eddie Hicks) adds a sabra robustness. “Buenos Aires” is a haunting piece, like a somber milonga danced late at night somewhere in La Boca while the waiters are already putting he chairs up on the tables. The sad, tuneful refrain makes you want to add lyrics to it. “Porqué me haces eso? Porqué a mi?” would fit. “Vienna” is dainty and refined, intricate and pretty like a lace ball gown twirled in an elegant waltz. Great piano and percussion weaving, through which the sax erupts with gentle precision. “Manhattan” moves in a way that reminds you why the phrase “a New York minute” was invented. The saxophone brackets the rhythm changes and describes the mood” confident, ebullient and climbing steadily with no pause for doubts. “Moscow” is ample and deep, quiet and massive, pensive and slow “as the Don flows” and a beautifully melodious tribute. “Somewhere in Italy” starts with a whisper: the sax describes the wind through the tall and graceful cypresses and pine trees drawn on an impossibly blue sky, a landscape adorned by beautifully ruined aqueducts. The sax also asks questions and answers them tenderly while the piano echoes them. “Berlin” is perhaps a roaring 20s beer garden or a nightclub in the early 30s or both, where you drank “Bruderschaft” and where, “all together, ladies and gentlemen,” you swayed and sang, happy to be there, still happy to be German. If you love jazz you will love this release of a superlative quality. If you love the music of the world in its individual uniqueness and diversity, and not the pasteurized kitsch of “multiculturalism,” you will love this even more and you will resonate to Atzmon’s worldview as a philosopher of culture, which he summarizes in the interview his wife skillfully coaxed out of him in this beautiful short film. feel initial disappointment at the restrained surface of some tracks. Several albums and numerous gigs have accustomed us to fiery, edgy, often confrontational work, but he has indicated that this angry turbulence had in fact become a comfort zone, so he felt the need to move into new territory. 'Paris' provides a slightly schmaltzy opening, but Atzmon's sumptuous chalumeau clarinet tone is a delight. A nod to Sidney Bechet via Acker Bilk, perhaps, and the funky, rhythmically-sophisticated 'Tel Aviv' demonstrates that Anmon's soprano sound is also one of the most satisfying since Bechet. “An interesting collection of locations inspires this album of musical evocations. Gilad Atzmon is in a reflective mood as he melodically recreates not only Paris and other cities, like Buenos Aires, Moscow, Tel Aviv and Berlin, but also such towns as Scarborough and, possibly, a more rural 'Somewhere In Italy'; certainly the work seems more pastoral than the others and even has Eric Dolphy-like bird song from the sax. Together with his superbly intuitive band, the well-travelled, hard-gigging Atzmon – an Israeli-born multireedsman who seamlessly marries bop with Middle Eastern music – has etched nine vividly evocative portraits of cities and towns, ranging from Manhattan and Buenos Aires to… Scarborough. Whether he’s blowing up a storm of notes or gently caressing a ballad, there’s a luminous vitality at the heart of Atzmon’s playing that’s irresistible to the ear. The fiery Israeli who hit London with a jazz-and-politics double whammy in 2000 has mellowed into a souvenir-collecting world traveller. Paris, Vienna, Berlin, Moscow and Manhattan are among his new titles here, each appropriately seasoned with local flavourings which add accordion, soprano sax and clarinet to the leader’s meaty alto saxophone. Buenos Aires, Tel Aviv, Scarborough Fair and even Somewhere in Italy also make the cut, but surprisingly not Cricklewood Broadway. Faithful Frank Harrison adds lyrical flourishes from the piano and the whole dish is heated by Yaron Stavi’s mellow bass and the sizzling drums of rookie Orienteer Eddie Hick. Their album-launch UK tour calls at the Pizza Express Jazz Club in Dean Street tonight and tomorrow. Gilad Atzmon’s spring UK tour, partially listed in JJ last month, is impressively larger (now around 40 dates) than any tour by his peers in recent memory. How does he get so many gigs, never mind the subsequent appearances in Japan, Argentina, Europe and the USA that take him away from home until mid-June? The Israeli-born, UK-resident reedman who says “I am upset by Israel, by Jewish politics” is known for a certain political notoriety – an often valuable currency in the modern jazz world – and one of my key questions for him is to what extent he has exploited that notoriety to further his musical career. At risk of biting the hand that feeds, Atzmon is sceptical about the British arts system, about the addition of form-filling to the musician’s skill-set, and it bears on his musical philosophy in general. For all his political sensibility and evident intellectual capacity (his website bears witness to the volume of writing he has done on musical and nonmusical matters), Atzmon holds that jazz at its best is a instinctive activity, one that is in perpetual danger of having its vital power drained by subsidising bodies propelled by an “Enlightenment” view of music. “What I am saying is not against the Arts Council – I think they are doing a lot of great stuff –but I believe that the existence of an artist should be inherently dependent on the ability to communicate with an audience – I don’t say big audience. The art form that I am involved with is basically the total opposition to the Enlightenment. The Enlightenment is there to praise the thinking human subject. But when it comes to art, the best of it is actually produced when you are totally unconscious. Although public subsidy trickles down to the benefit of just about everyone involved in producing or consuming (or commenting on) the arts, Atzmon’s tour is all his own work except for the help of a couple of agents. It seems of a piece with the dynamic, visceral outlook of this self-made man-musician. THE ENTREPRENEURIAL instinct goes back to the beginning. He didn’t play the saxophone, or jazz, until he was 17, and must have worked hard to achieve the technique and musical awareness he typically shows today as conceptualist, composer and soloist. Try, for example, the series of powerfully logical climaxes he creates towards the close of his solo on Tel Aviv on the new album, or the intensity of Buenos Aires at around 6:40. Notice, in addition, the admixture of harmonic movement in pieces that sound deceptively modal. Lest anybody should suspect there isn’t a lot of jazz here, Atzmon has paid his Real Book dues. He points out that Songs Of The Metropolis is different from his previous output because it moves away from the “D minor, Coltranesque” thing that exemplified such earlier albums as Exile – “except maybe,” he says, “in Scarborough Fair”. The jazz wood-shedding happened early, and its fruits were clearly evident in Atzmon’s first UK album, Take It Or Leave It... (1997, Face Jazz). It’s a brave debut with just bass and drums on which he brings a distinctive orientalism to his inflections and phrasing on In A Sentimental Mood and a fresh rhythmic dynamism to Doxy. Rollins would no doubt approve of his ability to let the music breathe. Atzmon’s muscular technique is always at the service of a provocative and witty musical imagination – the sound of surprise even in these late days for the standard repertoire. Where is this tune going to go next? The same urgency and clarity of expression can be heard in Atzmon’s playing, and the new record is conceptually a step along the same road. He says it’s a kind of protest (another – “I must always protest against something”) against the mush of cultural homogeneity, the “globalised flood”. It attempts to create clear if nostalgic portraits of once more distinctly differentiated locations. I tell him that Liebman once told me that jazz was now an international music. “Yes,” he says – “nobody cares about it anywhere!” One senses that Atzmon may change that attitude at venues across the globe in the coming months. WITH a freshly installed piano the Comedy Box at the Hen & Chicken, Bedminster proved an ideal setting for the Israeli-born saxophonist Gilad Atzmon to open their new season of jazz nights. Accompanied by The Orient House Ensemble this ultra-cosmopolitan musician performed mainly material from his recently released album Songs of the Metropolis – a jazzman's lament to the lost character of cities once noted for their distinctive musical voice. The musical arrangements gave ample opportunity for Frank Hamilton on piano and Eddie Hick on drums to display their own skills, while an avuncular Atzmon smiled down happily at his young protégés. The ever reliable Yaron Stavi on bass completed the ensemble. Switching smoothly between alto and tenor sax, clarinet, and the occasional brief interlude on the accordion Atzmon began with Paris. Not the frenetic American in Paris of Gershwin, but the moody impressionistic Paris of a louche smoke-filled nightclub. Then we were in Tel Aviv with up-beat busy tempos and a slight Yiddish twist. Berlin reflected the unsubtle waltz time of a German oompah band in a beer hall. Vienna, in contrast, had more of a nostalgic valse triste about it. Atzmon is also a novelist and political commentator with a notoriously abrasive attitude towards the rich and powerful. Between numbers he had a few jibes at the legacy of Bush and Blair in the Middle East, all delivered with his traditional dry laconic wit before he gave us the Burning Bush. He may have mellowed in the 20 years he has been settled in Britain, but his ferociously skilful technique on sax and clarinet has not diminished. London does not feature in his metropolis set, but Britain is unexpectedly represented by an impressive take on the traditional tune of Scarborough Fair. Off again to a chaotic bebop style Athens and then Buenos Aires. Not a lively tango, but a darker sleepy slow lambada. This jazz journey made for a highly satisfying evening before a large and very appreciative audience . The energy, the will to succeed, (and not to mention the eclecticism) seems endless. One stereotype, of course, is that Atzmon’s drive reflects the classic immigrant’s need to work twice as hard, to be twice as good as their host, to build their new life in a new land. After all it’s 16 years since Atzmon left Palestine for Cricklewood’s green and pleasant land. But Atzmon doesn’t do stereotypes. If he identifies with any community, it is not one defined by such limited notions as nationhood or ethnicity. Instead his home is among the community of jazz people striving to find new voices, new ways of expression. And for Atzmon these musicians are free of the trammels of time and place: whether it’s Coltrane in New York, Piazzolla in Buenos Aires or Bird all over the place. Atzmon has produced his most mature, and in many ways his most diverse, work to date. Gilad Atzmon is no stranger to the Jazzmann web pages be it as a multi instrumentalist, composer, author or political activist. So I’ll largely spare you (and myself) the historical spiel with which I normally begin my reviews. Since he moved to London from his native Israel in the late 1990’s the indefatigable Atzmon has become a major figure on the UK jazz scene releasing a series of fine albums with his working group the Orient House Ensemble as well as being a prolific sideman (across a variety of genres from tango to the Blockheads) and an in demand producer. He’s routinely described as the “hardest working man in jazz” (although Seb Rochford must push him pretty close) and his new OHE album “Songs of the Metropolis” is a reflection of his well travelled lifestyle. 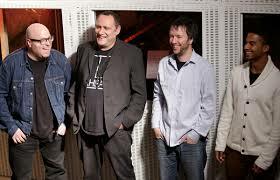 For this, his seventh album with ‘the hardest-working band in jazz’, the Orient House Ensemble (which has been working and touring the world together for twelve years now), Gilad Atzmon has taken as his theme the ability, as he sees it, of the song to ‘counter detachment and alienation’ courtesy of the idea that ‘each city ha[s] a melody, a resonance, a bell, an instrument, a voice’, and that, consequently, ‘beauty is perhaps the last form of spiritual resistance’ to the contemporary malaise for which ‘the planet weeps’. His band – keyboard player Frank Harrison, bassist Yaron Stavi and drummer Eddie Hick – has the ability to transform itself from a hard-driving acoustic jazz ensemble (their version of ‘Scarborough Fair’, for instance, develops into an almost Coltraneish polyrythmic thrash) into an elegant but punchy fusion band at the flick of a switch, so the various atmospheres Atzmon wishes to conjure up (Paris’s ‘love’, Tel Aviv’s ‘tragedy’, Buenos Aires’ ‘pathos’, Vienna’s sweet charm etc.) are all unfussily evoked by a series of compositions that, while they ostensibly bring out his more contemplative side (and his clarinet playing, in particular, is wonderfully expressive and considered), contain all the steeliness and controlled passion and power customarily associated with Atzmon’s music. Harrison is all lyrical fluency one minute, operating on acoustic piano, then colouring and shading the next by resorting to everything from Fender Rhodes to glockenspiel. Hicks and Stavi are characteristically alert and vigorous throughout, and overall this is a hard-hitting but wide-ranging set from an admirably tight and robust band led by one of the most charismatic and focused reedsmen on the planet. A calmer-than-usual concept set from the virtuoso saxophonist. Reedsman Gilad Atzmon is renowned for his virtuoso, high-speed, post-bop attack, and also for his equally hyperactive personality. This concept album explores a highly alternative resting ground, where nearly every song is a ballad, and even the occasionally faster-paced tunes emit an aura of relative calm. Atzmon’s concept is to dedicate his pieces to individual cities, inevitably conjuring an atmosphere of evocative cinematic suggestion. Although this Israeli wit has long resided in London, that’s one of the obvious cities missing from the tracklisting. Instead, Atzmon skirts from Berlin to Buenos Aires, and from Scarborough to Somewhere in Italy. Some of his followers might find this album frustratingly reflective, but Atzmon should be commended for changing his pace, and opening up his compositional space. It’s an imaginative side-step, and there are already many other Atzmon recordings that capture his fully accelerated soloing skills. Romantic introversion is at play on Paris, with a clarinet calm that could have passed through the lips of Acker Bilk. There’s a lounge bar easiness, but no blandness on show. Dappled piano and brushed snare and cymbals maximise the mood. All of this dwells within a big ballroom acoustic sound-space. Gilad Atzmon’s seventh album with his long-running quartet is a peon to a recent past, when urban spaces belonged to the people who lived in them, and cities had distinct emotional characters. The saxophonist/clarinettist portrays the idiosyncrasies with a masterly blend of controlled passion and sharp focus, eloquently mixing modal jazz, Middle Eastern scales and funky beats. “Vienna” is captured with a charming waltz, tragedy-haunted “Tel Aviv” with a funk-driven mash-up and “Buenos Aires” with a haunting, stately theme that gains pathos from an echo of accordion.